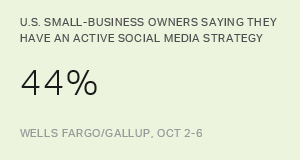 WASHINGTON, D.C. -- U.S. small-business owners continue to be optimistic about business conditions in 2018, according to the latest Wells Fargo/Gallup Small Business Index survey. 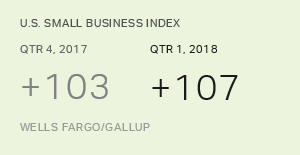 In the quarterly survey measuring small-business owners' attitudes about a wide variety of factors affecting their businesses, the overall index score increased to an 11-year high of +107, up from +103 last quarter. 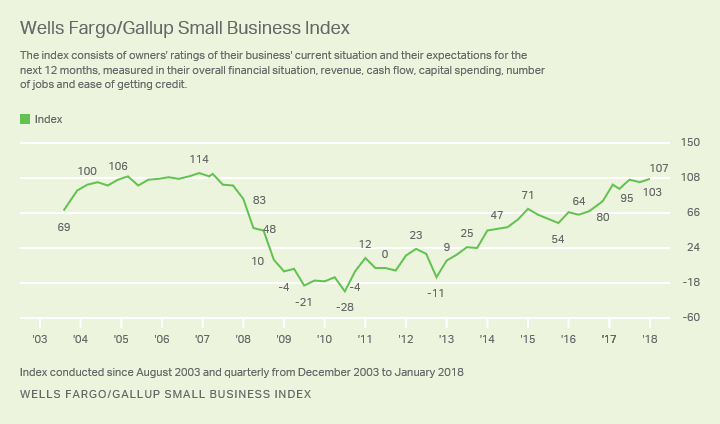 Small-business owners' optimism is now just shy of the record high in the 15-year trend of +114 registered in December 2006. After the Great Recession, the index bottomed out at -28 in the third quarter of 2010, and has been on a generally upward trajectory in the years since. The index rose sharply in late 2016 in the aftermath of the election of Donald Trump and has stayed high since -- exceeding +100 in each of the last three quarters. The current score is one point higher than the +106 registered last July, which was up from the +100 measured in January 2017. Owners' ratings of their future financial situation now match levels from December 2007 when the overall index was at its highest point. But owners now remain somewhat less positive about their current financial situation than was the case then, helping explain why the index remains slightly below the all-time high. The Jan. 3-9 survey finds a noteworthy improvement in small-business owners' reports of their revenues. A majority of owners (52%) now say their revenues increased a little or a lot in the past 12 months, higher than at any point since 2007. And 66% of owners expect their revenues to increase in the next 12 months, a sharp increase from the 58% measured last quarter, and the highest recorded in this 15-year trend. Small-business owners are also more optimistic about cash flow this quarter, with 77% expecting it to be very good or somewhat good in the next 12 months. This is, by two points, the most positive expectation about cash flow in the history of the index. Owners' reports of capital spending over the last 12 months are also tied for the highest level recorded, and the 38% who anticipate increased spending in the next 12 months is the most positive such expectation since 2003. One in four small-business owners cite issues relating to government and government policies as their top challenges. This category of responses includes 10% who mention taxes, about the same percentage as recorded each quarter over the past year, even though the survey was conducted after the new tax reform legislation was passed and signed into law by President Trump in late December. Still, the more traditional economic issues confronting businesses comprise the majority of responses business owners give when asked to name their most important challenge today. This includes such issues as attracting customers, hiring and retaining good staff, and managing cash flow. 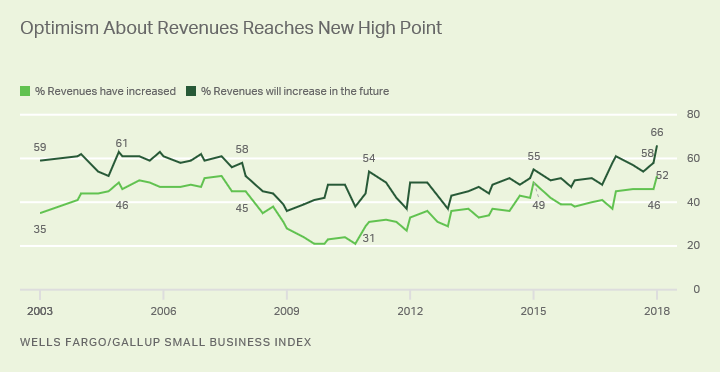 America's small-business owners continue to be optimistic about their business situations, and express record levels of optimism about key areas of their business -- especially their revenues and cash flows. 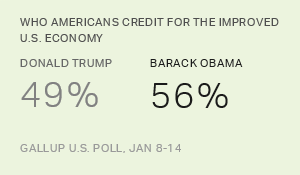 Owners' overall view of their economic situation as captured by the Index has yet to reach the high points measured in 2007, just before the recession, but is inching closer. 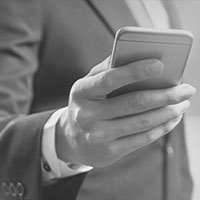 Results are based on telephone interviews with a random sample of 603 U.S. small-business owners in all 50 states, conducted Jan 3-9, 2018. The margin of sampling error is ±4 percentage points at the 95% confidence level. For more information about Wells Fargo Works for Small Business, visit http://wellsfargoworks.com/. Follow us on Twitter @WellsFargoWorks.